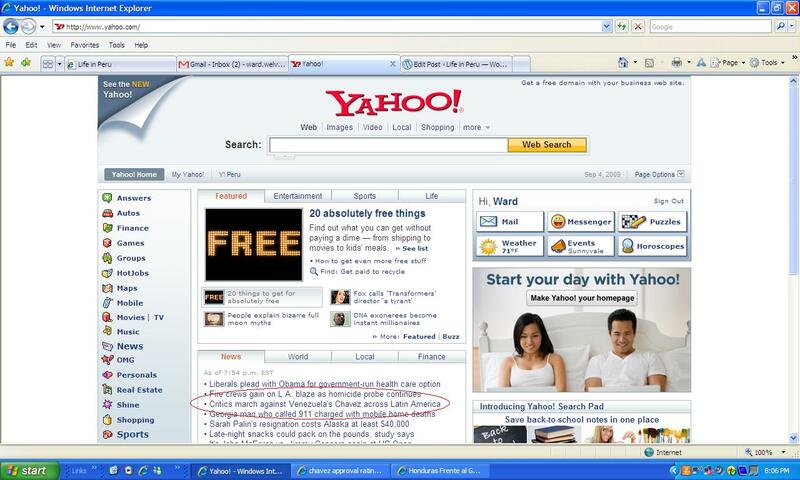 Read the rubbish from AP on the front page of Yahoo! English language media coverage of Latin America is such a joke. Have a handful of people turn out in an anti-Chavez demonstration led by none other than Roberto Micheletti, right-wing leader of a military coup, and it makes the front page of Yahoo! Never mind Hugo Chavez’ approval rating is higher than, you know, that of the leader of the free world. Ever read about Hugo Chavez’ approval rating in the media? Or about Evo Morales re-election prospects? Or about the massive anti-Micheletti sentiment in Honduras? The truth is Hugo and Evo are hugely popular in Latin America because they’re good for Latin America – or at least, exponentially better than the alternative. But you wouldn’t know by reading English language media. This entry was tagged AP, Chavez, media, Micheletti. Bookmark the permalink. Thanks for the comment, but I disagree. I’m sure what you’re seeing in terms of business people is valid. But at the end of the day, I disagree with the typical Western ideologies that what’s good for (big) business is also what’s good for the people. Look around in Peru and you’ll see that’s just not the case. To say that the quality of life, social & economic situation of the average Peruvian improves as big business/GDP/corporate profits improve is simply not true. While I agree that Western media is unusually hard on Chavez, I have to disagree with your overall take. I’d specifically disagree that Hugo and Evo are hugely popular because they’re “good for Latin America.” I’d attribute their popularity to a regional and cultural backlash against US Monroe Doctrine, especially in the wake of George W. Bush. PBS put out a great documentary on Hugo Chavez. Granted it’s Western media, but it’s good. I don’t disagree with everything you said about “big business,” but I’d argue that big business is absolutely necessary for countries in the 21st century. The negative effects of (in particular) Chavez’ unpredictable treatment of business interests have yet to truly take hold. But after having nationalized companies in oil, banking, cement, steel and others (coffee now??? ), foreign investment has begun to back off. Consequences resulting from no investment take years to notice. The only countries that can elect economic policies like those are oil-rich countries – countries that don’t have to earn wealth. There was just a story about how little Venezuela will fetch from oil companies from a new oil field auction, and Venezuelan oil is among the most worthless oil in the world (compared to Saudi, etc.). If Colombia or Peru did things like Hugo, Evo, or Rafael, their countries would quickly look like Daniel Ortega’s Nicaragua. I agree you can debate the merits of many of Evo’s & Hugo’s policies – they’re not silver bullets. In addition I don’t like Hugo’s inflammatory rhetoric. I also agree that big business is necessary because we need “organized behavior”, and Peru lacks organized behavior in the worst way – look at my apartment complex, no organized maintenance. I don’t mean to imply big business is intrinsically a bad thing, just that business in Peru is not implemented in a way that benefits ordinary Peruvians. It’s like the Old West, there are no rules. Just look at the occupational safety in the mines, the mines in Belgium were safe in the 1960s when my father worked there, the ones in Peru are dangerous even today. My overall take, the main reason why I like particularly Evo, is their departure from the traditional right-leaning LatAm governments that would do anything and everything for big business and nothing for their own citizens. I just don’t agree that “more of the same” is the right recipe for countries such as Peru.